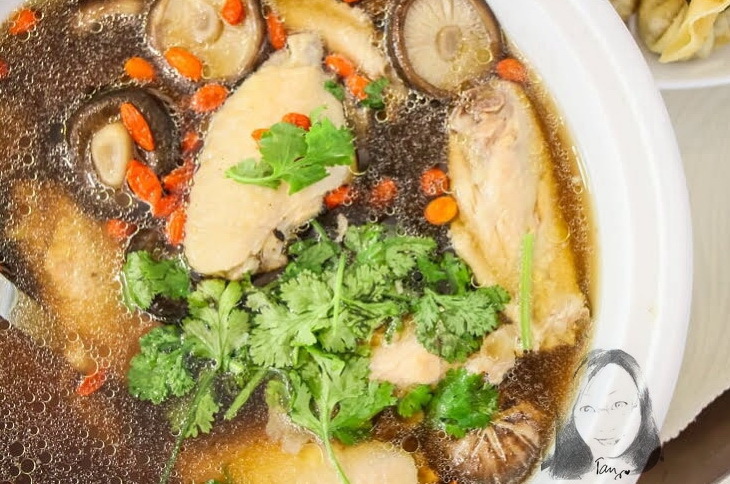 Chinese Herbs Braised Chicken Stew. This menu used chicken wings. Which chickens for this Chinese New Year Will mean prosperity in the job. Stewed with Chinese medicine and shiitake mushrooms that bless the rich Become a supplementary menu that can be made all year round.. Put the water in a pot, add a little salt to boil. Put the chicken into the blanch for a moment. Until the dust and blood from the chicken To scoop up and wash with water. Put the boiled chicken into a new pot, add 2 liters of water. Add garlic, Chinese jujube, dried longan, dried lotus seeds, tek (Chinese medicine) and boiled goji and shittake mushroom. Add the Chicken Soup cube to stir until dissolved and then lightly simmer for about 1.30 hours or until the chicken is tender. Put in a bowl, sprinkle with coriander, spring onion and serve hot.